Samsung Galaxy Tab3 7.0" Lite 3G and Wifi Tablet PC - Marvell PXA986 Dual-core 1.3 GHz Processor, Vivante GC1000 GPU, 1GB RAM internal memory, 8GB Storage, External Memory Support MicroSD (Up to 32GB), Capacitive Touchscreen 7.0" Display TFT, Resolution: 1024 x 600 pixels / 170 ppi, 3G, Bluetooth: 4.0 , WiFi: IEEE 802.11 b/g/n connectivity, Main Rear Camera CMOS, 2.0MP, GPS with GLONASS, Sensors: Accelerometer, Ambient Light Sensor, Geo-magnetic, Dual band WiFi, Micro-USB port, Li-Ion 3600mAh battery, Android OS, v4.1 - WHite, Retail Box Copyright © 2019 ComXpert International CC - COPYING IS ONLY ALLOWED FOR THE PURPOSE OF SENDING US ENQUIRIES. E&OE. The thin, lightweight design of the Galaxy Tab 3 Lite makes it easy to tuck away and take with you wherever you go. And with up to 8 hours of battery life and a 1.2GHz Dual Core processor, dependable power is always within reach. Watch a movie, go shopping, play games, listen to music, read the latest novels, even check in on all your Pinterest boards and Facebook. With the Galaxy Tab 3 Lite, there are endless ways to relax, be entertained and stay informed. Enjoy access to over a million apps and games from the Google Play Store. Download any app you’ve purchased to your Galaxy Tab 3 Lite and you’re ready to go. Check out top apps like Skype, Pinterest, Facebook, and fun games like Candy Crush Saga. With Galaxy Gifts, you’ll also receive content and services like 3 audiobooks on Audible, 3 months of SiriusXM Internet Radio for new users and more. The best price and guaranteed service and backup from official computer suppliers in South Africa for the SM-T116NDWAXFA Samsung Galaxy Tab3 7.0" Lite 3G Dual-core 1.3 GHz 8GB Android 4.1 Tablet PC. 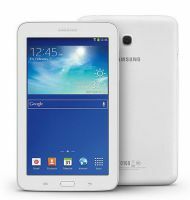 The Samsung SM-T116NDWAXFA Samsung Galaxy Tab3 7.0" Lite 3G Dual-core 1.3 GHz 8GB Android 4.1 Tablet PC is available for R2070. The product is sold by ComX Computers as new. Prices are valid today 2019-04-22 (before 2019-04-23 , by quote, while stocks last). The product is expected to be in stock, although this is not guaranteed. Find related SM-T116NDWAXFA Samsung Galaxy Tab3 7.0" Lite 3G Dual-core 1.3 GHz 8GB Android 4.1 Tablet PC products in our Android tablets Category for even more options. Read reviews and find out about SM-T116NDWAXFA Samsung Galaxy Tab3 7.0" Lite 3G Dual-core 1.3 GHz 8GB Android 4.1 Tablet PC. Discounts, specials and cheap prices only at ComX Computers.